France’s decision to outlaw face veils sparked a robust debate about religion and women’s rights. In response to concerns that the law will negatively impact Muslim women, its advocates frequently mention that it enjoys the approval of several prominent French Muslim feminists. What is not mentioned, however, is that behind their feminist façade, these women have a troubling record of harassing the women they claim to speak for. Discussions of Muslim feminism in France tend to focus on one woman: Fadela Amara. Born to Algerian immigrants in the 1960s, Amara grew up on the margins of French society. Disillusioned by racism and inequality, she found her voice as an activist in the 1980s. Amara entered the national spotlight in 2004 after founding Ni Putes Ni Soumises (“Neither Whores Nor Submissives”), an organization that raises awareness about gendered violence in France’s suburbs. She later left the group to serve in Nicolas Sarkozy’s government, first as Secretary of State for Urban Policies, and currently as Inspector General for Social Affairs. Ni Putes Ni Soumises (NPNS) rose to prominence in 2003 and 2004 with a mission to speak out against misogyny in France’s suburban, largely Arab “ghettoes.” The group’s rhetoric was deliberately provocative, and some accused its activists of going too far, and unfairly stereotyping suburban (Muslim) men as thugs and rapists. Fadela Amara actually confessed that this was true, but she claimed the organization had changed. While she and NPNS may (or may not) have stopped demonizing Muslim men, their obsession with women’s clothing has only intensified. Banning the face veil, or niqab, has been a priority for Amara. According to her, the garment “represents not a piece of fabric but the political manipulation of a religion that enslaves women and disputes the principle of equality between men and women.” NPNS takes the same position, and argues that the ban will “liberate” French Muslims. But Amara’s view of the world is a deeply skewed one. Where others see a common headscarf, she perceives a diabolical conspiracy to destroy France. She describes the headscarf as “the visible symbol of the subjugation of women,” insists it is “the sign of a political plot” and blames its presence on “green fascism.” Perhaps not surprisingly, she was a staunch supporter of the 2004 law banning headscarves in French public schools. Opposing the right of women in hijabs to be public servants is bad enough, but NPNS has gone even further by vocally supporting employment discrimination. 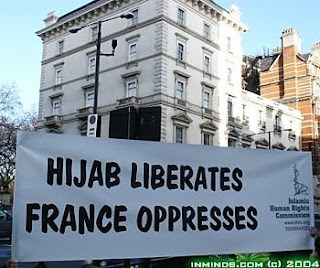 In 2010, the French media was abuzz after a court rejected the lawsuit of a woman who lost her job for wearing a headscarf. Because the woman’s place of employment – a childcare center – was privately run, it was thought to be exempt from the ban on “religious symbols” in French public institutions. But a court determined that because the center received partial public funding and “indirectly” performed a state service, it was allowed to enforce “religious neutrality,” and could ban employees from wearing the hijab. Both Fadela Amara and NPNS celebrated the decision, even though it could open the door for other employers to shun Muslim women.